He wrote such amazing stories like “Fahrenheit 451“, “Dandelion Wine” and “The Martian Chronicles.” One of my favorite books (one I read over and over) is “The Halloween Tree.” Another amazing novel that I have read more than once is “Something Wicked This Way Comes.” This novel was made into a movie but the filmmakers didn’t even get close to painting the wonder and mystery presented by this story. Bradbury was one of those rare writers that wrote prose that read like poetry. I haven’t read this novel in several years but I can still see and feel and even smell the lives of the boys involved. I think his most amazing short story is “August 2026: There Will Come Soft Rains.” He wrote this in 1950. This is an amazing story that doesn’t have a single person in it. It is a poetic glimpse into an apocalyptic world where only the machine keep trying to do their jobs even unto their destruction. I read this story often. 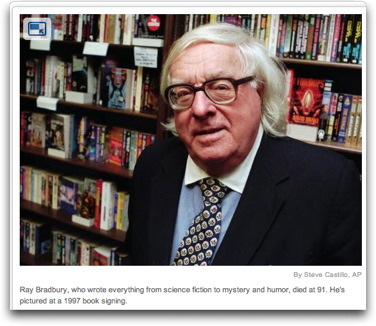 If you have never read a Bradbury story read this one. The writing is just not human. Ray kept working right up to the end of his life and I am so sad that he is gone. He is the kind of person who points out the things we should be paying attention too while we are mired in chaos. “Soft Rains” gets it name from the song by Sara Teasdale. If you have never read any of Bradbury’s work, read this one short story and you will see how he magically transformed a short story into poetic art. Ray, I will miss you. God bless you and thanks for all the wonderful stories you have left behind.